London and ICC: Capital of Chess! At the end of an intense year, filled with interesting and enthralling chess events, the curtain rises for the final act: The London Chess Classic! This amazing event sees a line-up that makes it one of the most important tournaments of all times. Magnus Carlsen and Judit Polgar the "Numero Uno" duo, had a shootout just few days ago, when they faced over the board for the exhibition games in Mexico City, the 2nd UNAM Festival. Judit surprised Magnus in the first game (Rapid), with a deep tactical shot, and the Norwegian genius realized a second too late that he was totally lost. Magnus won the next game (Blindfold) and the final playoff. Now they will met again the 7th round of the London Chess Classic, with a recent precedent that will make the game uber-interesting to follow. 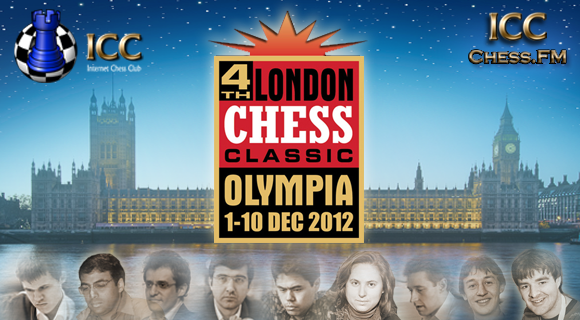 The fireworks start Saturday, December the 1st, with #1 Magnus Carlsen, World Champion Vishy Anand, #2 Levon Aronian, Former WC Vladimir Kramnik, American hero Hikaru Nakamura, the best ever female player Judit Polgar, and the English squad, with Michael Adams, Luke McShane and out ChessFM friend and commentator Gawain Jones. We will have the traditional online TRIVIA and the TRIVIA main prize in the Game Of the Day video, where a lucky ICC member can win a one-year subscription to the best chess magazine out there: New in Chess! If the audio isn’t working you can also try listening to it here: https://www.chessclub.com/broadcast.